Cozying up with the hilarious English actress before Vanity Fair’s young Hollywood party. “I want to listen to music so loud I can’t breathe,” says Poppy Delevingne of her usual getting-ready ritual. “I want the walls to crack!” She lets out an outrageous, throaty laugh. Tonight, however, she’s practically sedate, preparing for Vanity Fair’s Young Hollywood Party. It’s a chilly night in the hills, and Delevingne has chosen to curl up in front of a roaring fire in a dressing gown. Two Weeks Notice, the Sandra Bullock–Hugh Grant rom-com, is playing in the background. The only thing disturbing the scene is the actress herself, who is hilarious. “Literally I feel like I just stepped out of Slytherin House,” she says of her look, in particular the icy blond hair. “That’s my vibe.” She has been auditioning in LA for three weeks, staying with her friend, stylist Chloe Bartoli. “I’ve got an incredibly supportive husband who’s, like, go follow your dream—and don’t come back until you’ve done it,” she laughs of her monthlong stay on the West Coast. Before braving the red carpet, Delevingne took the time to talk to VIOLET GREY about Khaleesi glam, the very best bronzer, and her undying love for Alan Rickman. How do you feel about the beautification process? I’m so used to having my face touched and prodded that it doesn’t really bother me. But I do like a really calm atmosphere when I’m doing it. I like having a comforting chick flick on in the background, and a roaring fire, and genuinely lovely people. I think it’s a great way to start your night. I always get really nervous about these kind of things; they freak me out! I shake like a leaf! How long have you been a platinum blonde? 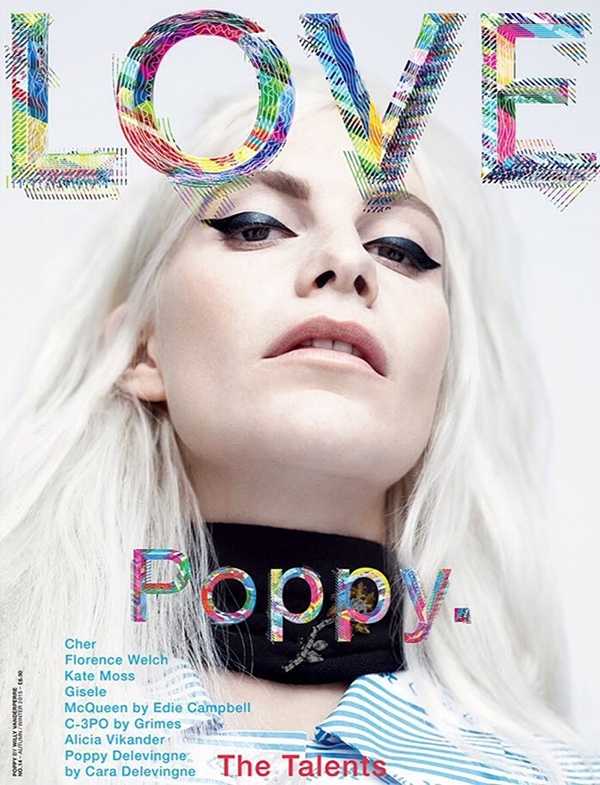 I’ve been platinum two years come June, thanks to Katie Grand [Delevingne first bleached her hair for a LOVE magazine cover, shot by Willy Vanderperre]. I remember her saying, “I’m going to make you go white like a polar bear.” But now I can’t imagine being anything else but. Every five to six weeks I do my roots. And I give it a lot of love and attention because I want to have it as long as possible. I use System Professional, which has been the best thing for me. Their luxe oil is so good when you have bleached hair. I’m a Khaleesi. Or as a lot of people say, Draco Malfoy [laughs]. Literally I feel like I just stepped out of Slytherin House. That’s my vibe. What’s your skincare regimen like? I’m a beauty junkie. I love lotions and potions and bottles piled up on my bedside table. And I love using a mixture of things. I love Skinceuticals. That kind of scientific, apothecary approach. I love hydrating face masks by Sisley. But then I also love natural skincare, and there’s this amazing line called MV Organic by this wonderful woman called Sharon from Australia. She comes into town twice a year and I use a lot of her stuff. My makeup is L’Oreal, Charlotte Tilbury, and Chanel. From Charlotte, the Filmstar Bronzer and Glow. I mean, beyond. It makes you look like a slippery seal—in a good way. And I love that she’s always coming up with new things. When my face is really dehydrated, I always rely on her magic cream, because it really is magic. And I love her mascaras, and her lipsticks in Glastonbury and Electric Poppy, which are hot pink. Are you a fragrance woman? I’m a Jo Malone London girl, and I’ve been wearing her since I was 21 and someone gave me a bottle of Red Roses. I now actually wear their Tuberose Angelica. It’s like growing up. It’s slightly sexier and muskier and reminds you of the nighttime. But still has that rose essence that made me fall in love with Red Roses in the first place. If you were going out with your friends tonight, how would you prepare? I like to listen to music so loud that I can’t breathe. I want the walls to crack. It’s a very different vibe. It’s a different Poppy! At the moment I’m not drinking so I’m obsessed with LaCroix, the peach one. But otherwise, a tequila on the rocks with some fresh lime. That sends you on your way with a big smile on your face. Do you have an LA beauty address book? What’s always in the bottom of your bag? Who’s your ideal dinner date? Can I have Alan Rickman back? When I was a small girl I watched Robin Hood: Prince of Thieves, where he was Sheriff of Nottingham. I could never understand why Maid Marian would go for Robin Hood when she could have had the Sheriff! I was like, I think he’s absolutely charming and brilliant and clever and very important and I’m in love. And that’s the moment I fell in love with Alan Rickman. My dream was to meet him and hear his voice. You know I’m going to get straight home from the party and have an Alan Rickman watching session.